There is so much to love about Northern Virginia! There is something for everyone here, all within a day’s drive: nature lovers embrace endless parks, bike trails, lakes, rivers, mountains and caves; history and theatre buffs revel in a huge array of museums (most with free entry), a vibrant theatre scene, and numerous historic battlefields; foodies and wine enthusiasts choose from award winning restaurants to beautiful, scenic vineyards; families love the countless adventures, both indoor and outdoor, that are kid- and pet-friendly; and for nights out, there are casinos and nightclubs. Transportation within NOVA includes easy access to three international airports, Space-A travel out of Andrews Air Force base, Amtrak and an excellent public transportation system for commuters. ARLINGTON is an independent city complete with its own local government and school system. One of the most notable structures in Arlington is The Pentagon. Arlington includes bustling metropolis neighborhoods like Rosslyn and Ballston, as well as nature-filled suburban communities nestled among parks and bike trails. It has several metro stations which, combined with an extensive bus system, make for easy access to places throughout the D.C. Metropolitan area CLICK HERE for more on Arlington and its neighborhoods, or to search for homes in the area. The CITY OF ALEXANDRIA includes the historic district of Old Town Alexandria, also known as the Alexandria Waterfront. While known for its quaint historic charm, new construction is bringing luxury townhomes and condominiums to the area. The City of Alexandria is adjacent to the section of Fairfax County also referred to as Alexandria; the city, however, differs in its city and county government and school systems. For more information on Alexandria and its neighborhoods, or to search for homes in the area, CLICK HERE. FAIRFAX COUNTY is the largest and most densely populated of the three counties. It is also the most popular for those commuting to the Pentagon, Washington D.C. and Ft. Belvoir due to it’s proximity to all of these. Fairfax schools have repeatedly been among the top in the country (use GreatSchools.org to research specific schools). While more urban and populated than other counties, it has a number of fantastic parks, bike trails and even a few small non-motorized-craft lakes, so you can still “get away from it all”. The cost of homes in this area will generally be more expensive than those areas south of the Occoquan River. For more information on Fairfax and its neighborhoods, or to search for homes in the area, . PRINCE WILLIAM COUNTY is a large county spanning urban to rural landscapes. The Northern edge is defined, in part, by the Occoquan River, and its Eastern border lines the Potomac River. Shopping at the Potomac Mills outlet mall of over 200 stores is just a short drive away from horse country in Nokesville. Notable neighborhood communities in Prince William including Montclair, voted by Money Magazine as one of the Top 100 places in the U.S.A. to live, and Potomac Shores, a new development boasting a Jack Nicklaus Championship Golf Course and, opening in 2017, a two-mile Boardwalk along the Potomac, complete with high-end retail and eateries. Public transportation, commuter lots and easy access to Hwy 95 and Routes 1 and 234 make this a reasonable commute for those headed to the Pentagon and Ft. Belvoir, and a cakewalk for those stationed at Marine Corps Base Quantico. For more information on Prince William and some of its communities, or to search for homes in the area, Click Here. 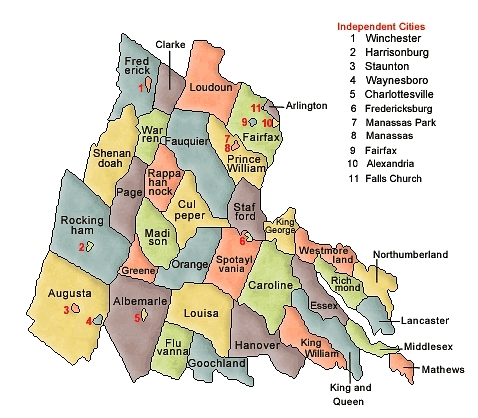 STAFFORD COUNTY is the most rural of the counties. Stafford is proud of its history and heritage; most notable is George Washington’s childhood home on Ferry Farm. Located immediately south of Quantico, Stafford is a popular home for our Marines and others working on Marine Corps Base Quantico. However, great housing values here make it a popular place even for those commuting to the Pentagon and into D.C. Stafford has water-front communities in the East and rolling hills in the West. Those looking for retail or restaurants will find many in Stafford; it is also a short drive to Woodbridge or Fredericksburg. For more information on Stafford and some of its communities, or to search for homes in the area, Click Here.